All photos by Pascal Reilly, Click on photo to enlarge. 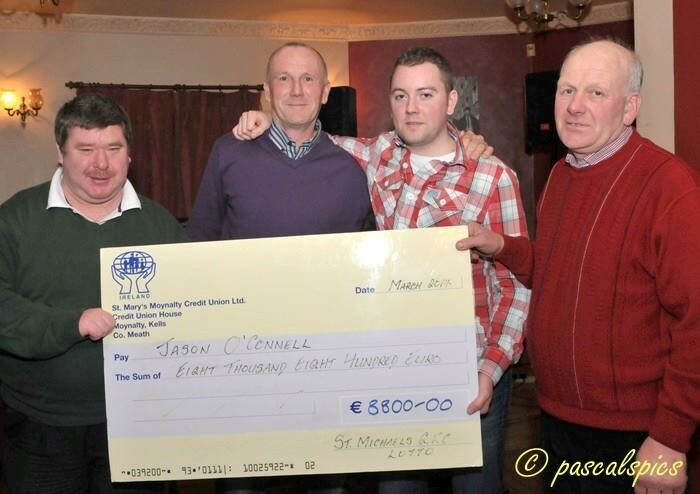 Jason O’Connell, €8.800 March 2014. 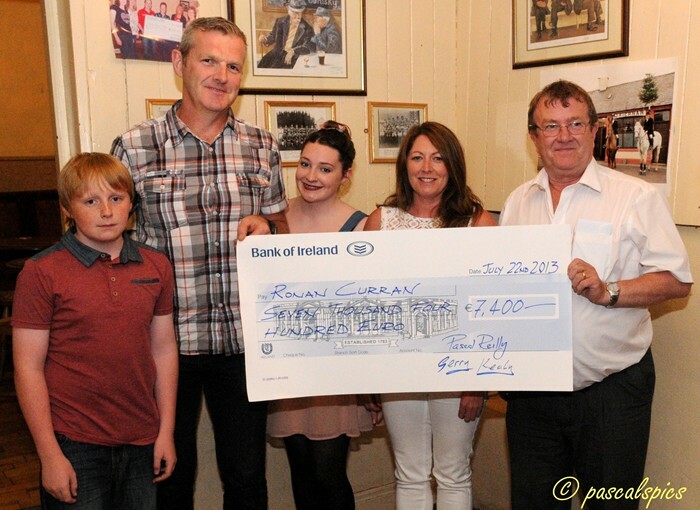 Ronan Curran €7,400, July 2013. 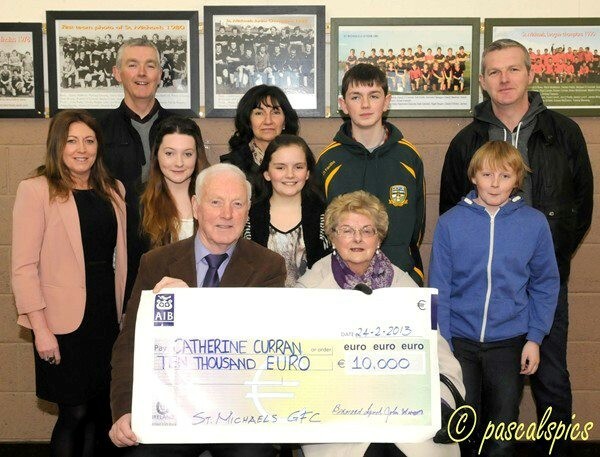 Catherine Curran €10,000, Feb. 2013. 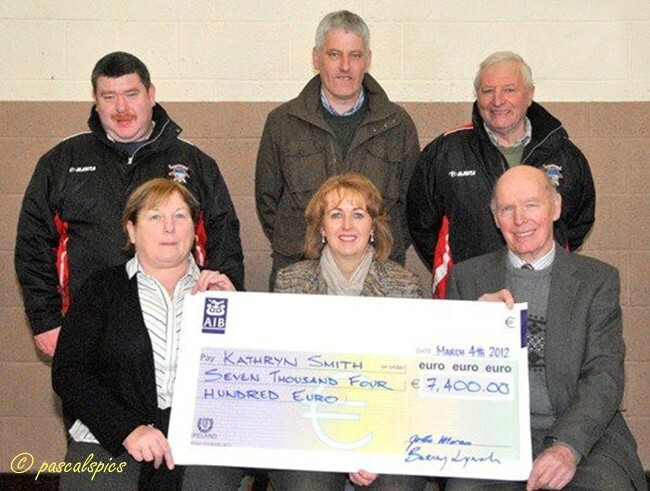 Kathryn Smith €7,400, March 2012. 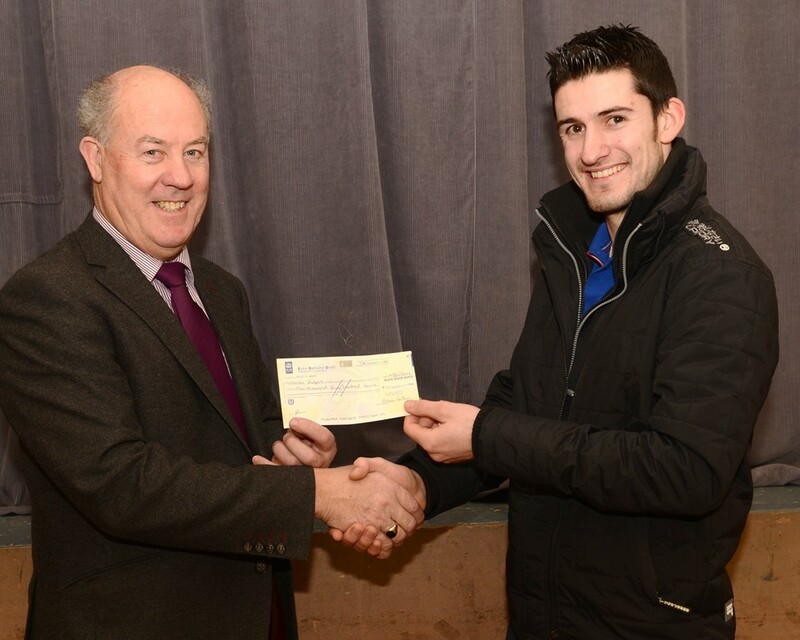 Aidan McDonnell €7,400, March 2011. 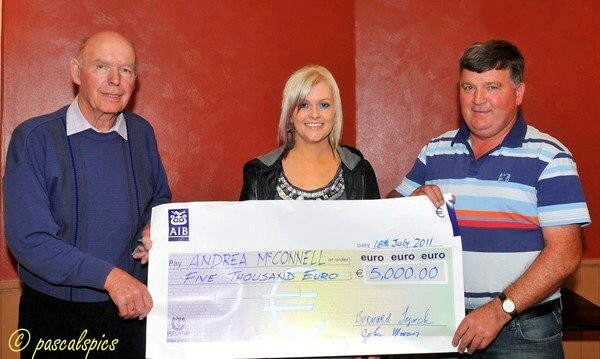 Andrea McConnell €5,000, July 2011. 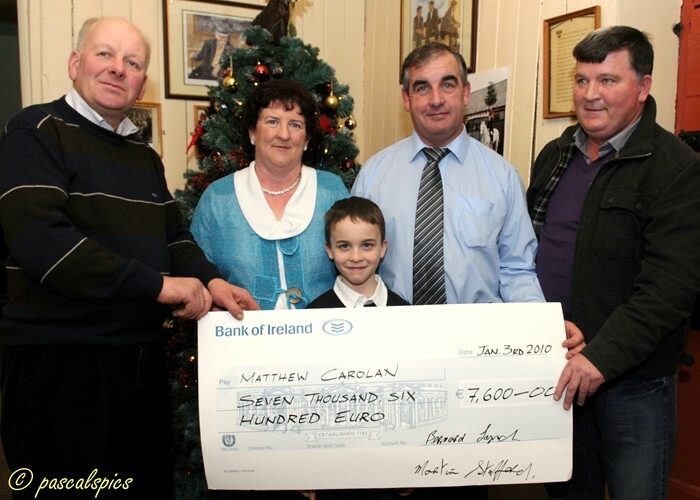 Matthew Carolan, €7,600 Jan. 2010. 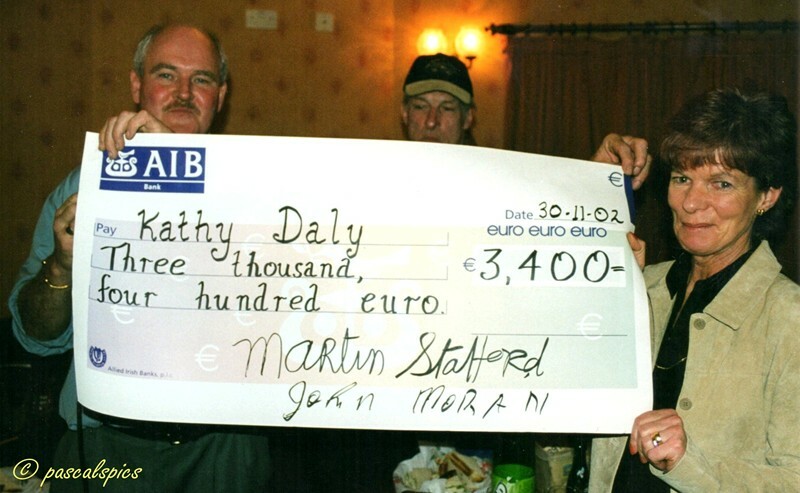 Kathy Daly, €3,400, Nov. 2002. 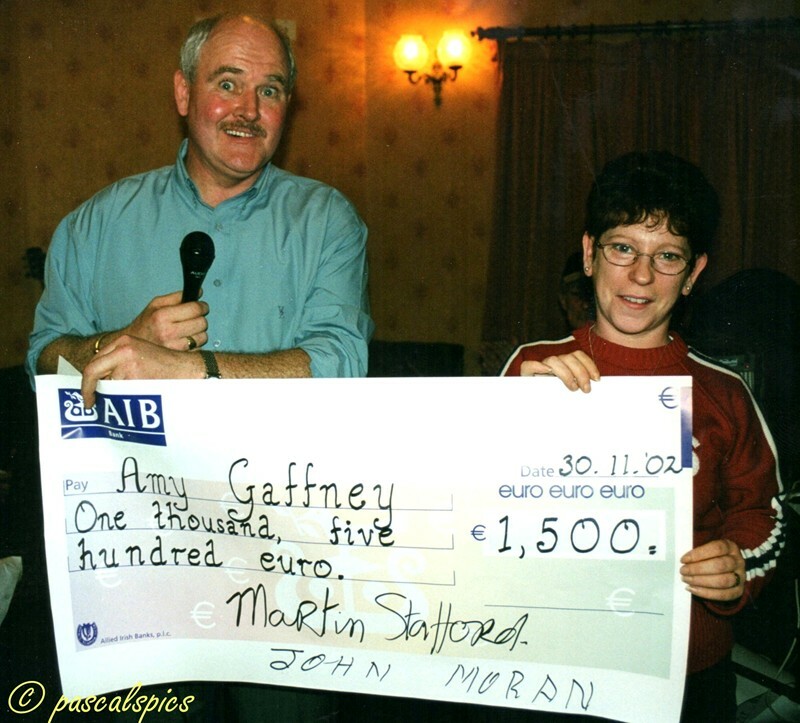 Amy Gaffney €1,500, Nov. 2002 ( mother Tina RIP receiving cheque ). 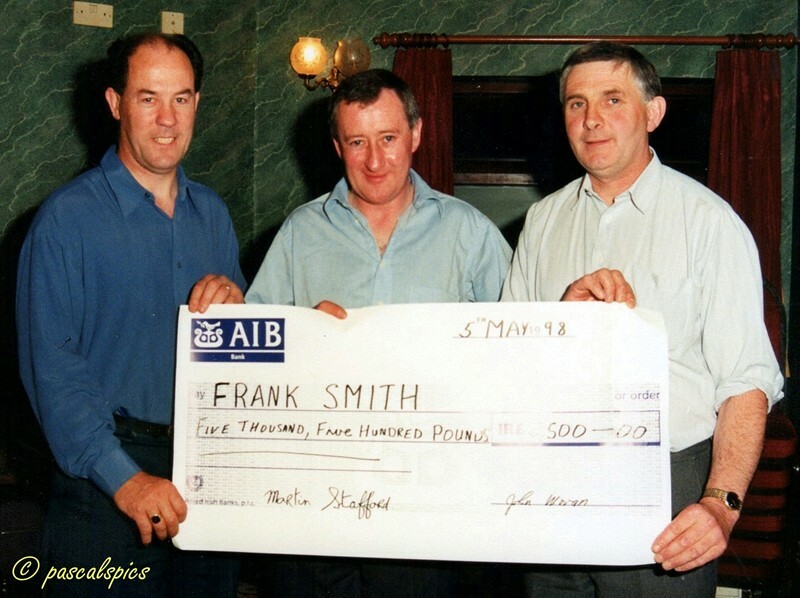 Frank Smith £5,500, May 1998. 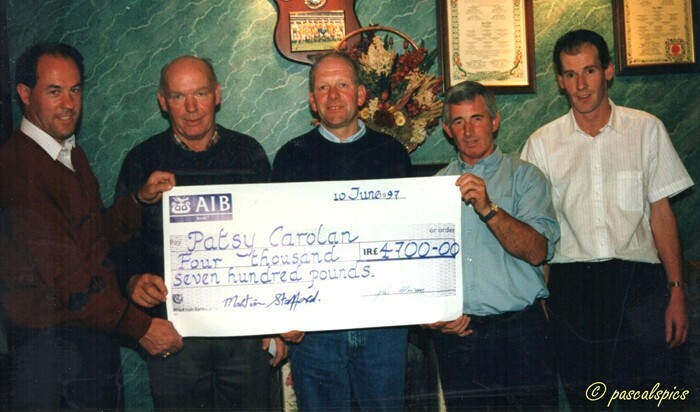 Patsy Carolan €4,700, June 1997. Numbers drawn 15-18-19-27, No winner. 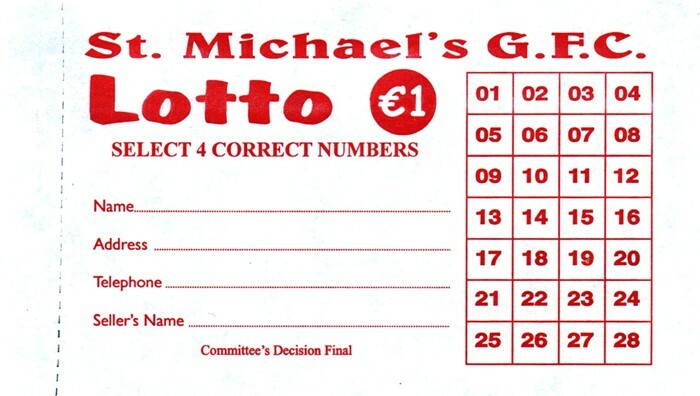 5 x €40 Lucky Dip Winners: Elica Carolan, Gerry McCormack, Simon Dunne, Betty Meehan, Pete’s Cassidy. Next Weeks Jackpot: €2,100. Draw on Monday April 24th in Kiernan’s Bar. 5 x €40 Lucky Dip Winners: Geoff Doyle, Paddy & Irene Smyth, Mark O’Connell, Colm Cassidy, Frances Stafford. Next Weeks Jackpot: €2,000. Draw on Tuesday April 18th in Gerry’s Bar. Numbers drawn 04-08-15-23, No winner. 5 x €40 Lucky Dip Winners: Pat Tighe, Teresa McConnell, Laoise Beirne, Ronan Curran, Ryan Gaffney. Next Weeks Jackpot: €4,400. Draw on Monday April 10th in Kiernan’s Bar. Numbers drawn 04-17-19-20, No winner. 5 x €40 Lucky Dip Winners: Anna McAuley, Lucy Carolan, Thomas Rogers, Robert Sheridan, John McConnell. Next Weeks Jackpot: €4,200. Draw on Monday April 3rd in Gerry’s Bar. Numbers drawn 03-07-15-21, No winner. 5 x €40 Lucky Dip Winners: Mary Doherty, Patsy Curran, Kitty Monaghan, Brigid Rooney, The Smith Family. 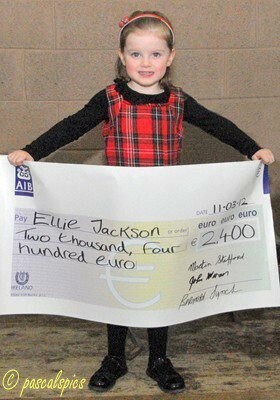 Next Weeks Jackpot: €4,000. Draw on Monday March 27th in Kiernan’s Bar. Numbers drawn 01-07-23-26, No winner. 5 x €40 Lucky Dip Winners: Katie Kealy, Pascal Reilly, Joe Conaty, Richard Smith, Catherine O’Neill Stafford. Next Weeks Jackpot: €3,800. Draw on Monday March 20th in Gerry’s Bar. Numbers drawn 07-15-24-27, No winner. 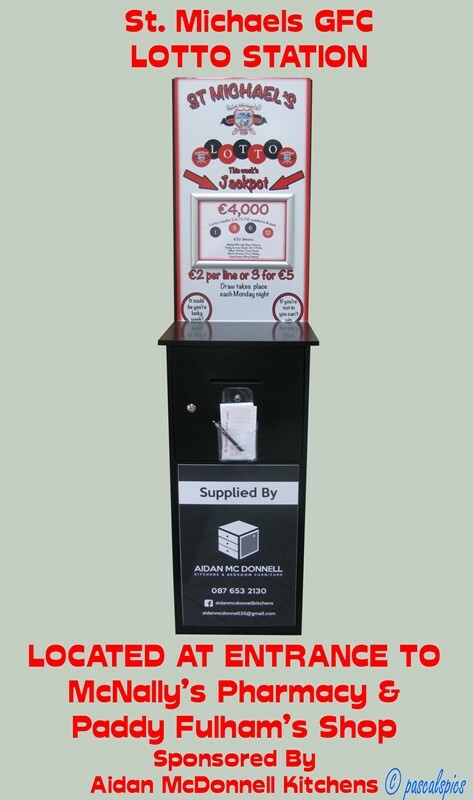 5 x €40 Lucky Dip Winners: Niall Carolan, Sinéad, Niamh & Shane McCormack, Barbara Griffin, Caroline Walsh, Terry Kangley. Next Weeks Jackpot: €3,600. Draw on Monday March 13th in Kiernan’s Bar. Numbers drawn 01-04-12-27, No winner. 5 x €40 Lucky Dip Winners: Nancy McGivern, Amby Cassidy, Anna Gaffney, Pat Dillon, Margaret Reilly. Numbers drawn 02-07-11-12, No winner. 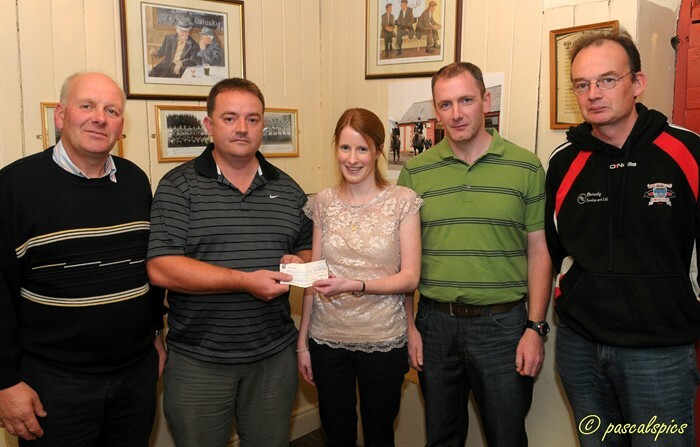 5 x €40 Lucky Dip Winners: Eoin O’Sullivan, Vincent Flanagan, Conor Doherty, The Gaffney family, Dermot Sheridan. Next Weeks Jackpot: €3,200. Draw on Monday Feb. 27th in Kiernan’s Bar. Numbers drawn 15-24-26-28, No winner. 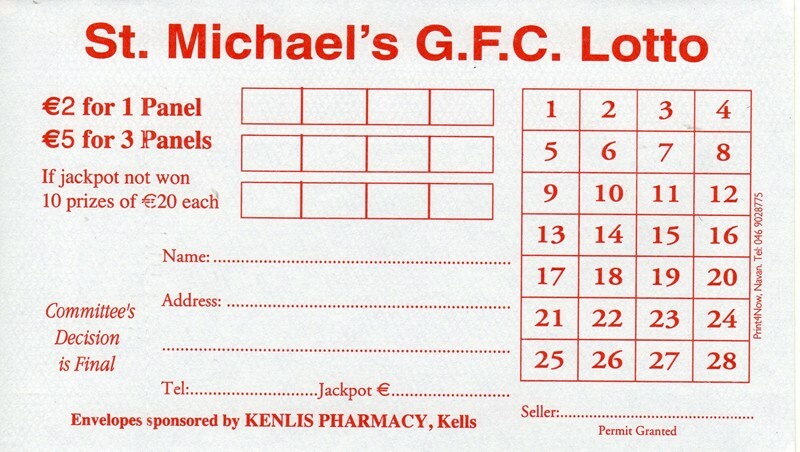 5 x €40 Lucky Dip Winners: Christy Price, Ciaran Lynch, Oliver Carolan, Peggy C/O Francie Greene, Francie Greene. Next Weeks Jackpot: €3,000. 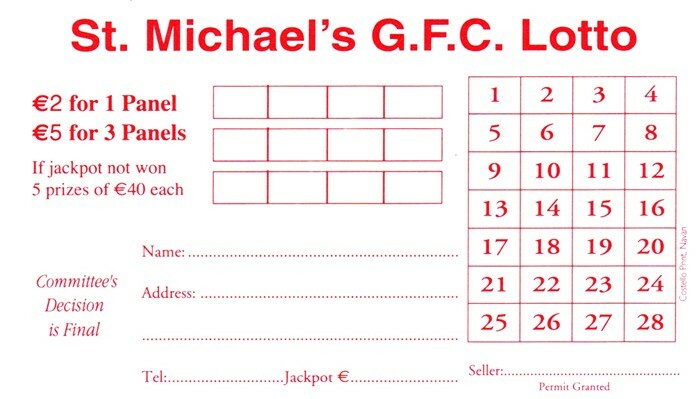 Draw on Monday Feb. 20th in Gerry’s Bar. Numbers drawn 02-22-23-26, No winner. 5 x €40 Lucky Dip Winners: John Lee, Shane O’Connell, Blondie Lynch, John Flood, Lauren Mahon. Next Weeks Jackpot: €2,800. Draw on Monday Feb. 13th in Kiernan’s Bar. Numbers drawn 03-06-19-21, No winner. 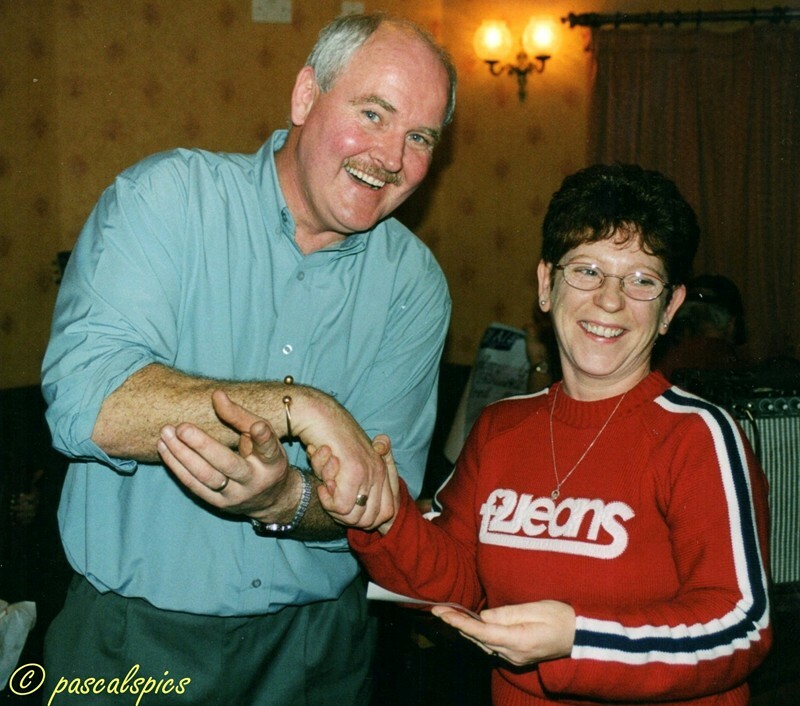 5 x €40 Lucky Dip Winners: Michael Tighe, John Clinton, Dolores Gaffney Fox, Jackie Lynch, Sheila Tighe. Next Weeks Jackpot: €2,600. Draw on Monday Feb. 6th in Gerry’s Bar. Numbers drawn 01-08-10-16, No winner. 5 x €40 Lucky Dip Winners: John Clarke, Barney lynch, Larry Stafford, Thomas McQuaid, Deirbhile Readien, Joseph & Cian Curran. Next Weeks Jackpot: €2,400. Draw on Monday Jan. 30th in Kiernan’s Bar. Numbers drawn 06-13-20-26, No winner. 5 x €40 Lucky Dip Winners: Ann O’Brien, Mary Flood, Deirdre O’Malley, Michael Tighe, Margaret Gray. Next Weeks Jackpot: €2,200. Draw on Monday Jan. 23rd in Gerry’s Bar. 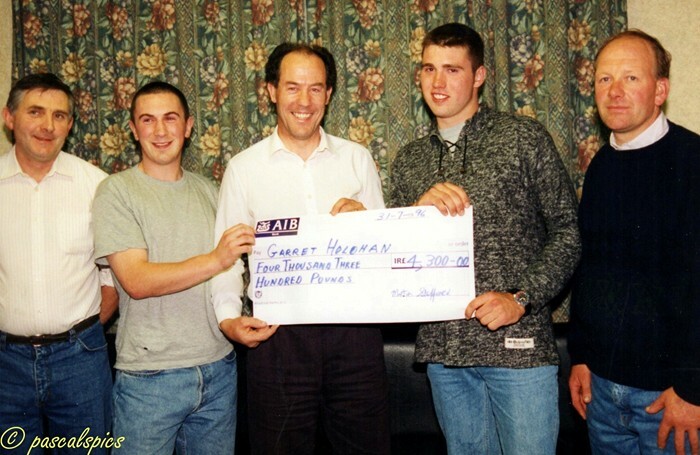 Numbers drawn 04-08-24-25, one winner. Numbers drawn 07-10-11-17, No winner. €20 Lucky Dip Winners: Gerry Kealy, Sonni Moran, John Moran, Tom & Mary Moran, Eddie Moran, Liam Hand & Damien McDermott, Peter Clinton, Quality Cabin Fever, Tommy Carroll, Brendan Ryan. Numbers drawn 09-15-22-23, No winner. €20 Lucky Dip Winners: Frank Tobin, Mark O’Connell, Tina Farrelly, Frances Stafford, Peter O’Connell, Sharon Hogan, Colm Sharkey, Frank Fitzsimons, Kevin Lynch, Michael Tighe. Numbers drawn 03-05-08-28, No winner. €20 Lucky Dip Winners: Raymond Cassidy, Bernadette Bird, Jimmy Farrelly, Nipper Brady, Patsy Crosby, Peggy Carolan, Lucy Carolan, Martin Flanagan, Pete’s Cassidy, Jenny Lynch. Christmas Draw prizes: Meat Voucher: Tommy Carroll, Bottle Wine: John Clarke, Box Chocolates: Martin Lynch, Tin Biscuits: Colin McDonnell. Next Weeks Jackpot: €10,000. Draw on Tuesday Dec. 27th in Gerry’s Bar. Numbers drawn 04-15-18-25, No winner. €20 Lucky Dip Winners: Barney Lynch, Ultan Carroll, Jenny Lynch, Benny Murphy x 2, Kitty Monaghan, Martin Reilly, Joan Gaffney, Quality Cabin Fever, Elma Kenny. Christmas Draw prizes: Meat Voucher: Carmel Curran, Bottle Brandy: Christopher Monaghan, Box Chocolates: Maeve Sheridan, Tin Biscuits: Nipper Brady. Next Weeks Jackpot: €9,800, Draw on Monday Dec. 19th. 2016 in Kiernan’s Bar. Numbers drawn 04-11-12-25, No winner. €20 Lucky Dip Winners: Christine Lynch, Johnny Monaghan, David O’Connell, Pat McMahon, Geneive Dolan, Jimmy Smith, Adrian O’Donnell, Irene Brady, Francie Greene. Christmas Draw prizes: Meat Voucher: Terry McGivern, Bottle Brandy: Pat Tighe, Box Chocolates: Patrick Murphy, Tin Biscuits: David Moran. 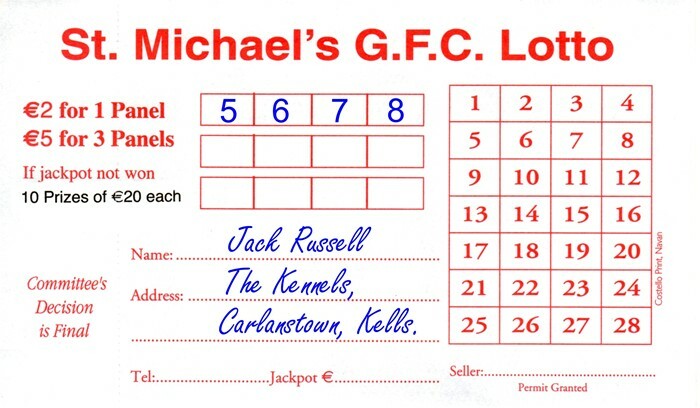 Next Weeks Jackpot: €9,600, Draw on Monday Dec. 12th in Gerry’s Bar. 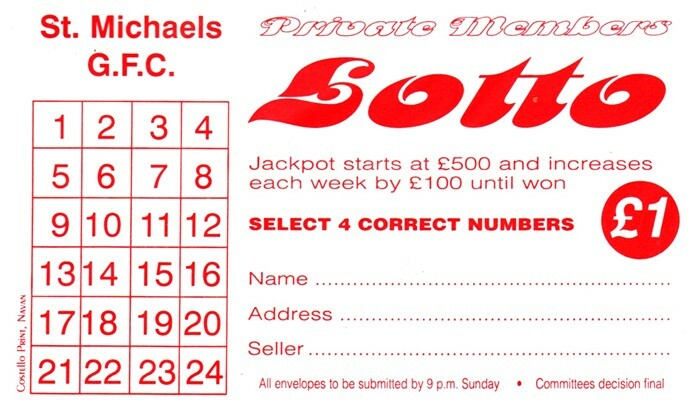 Numbers drawn 04-07-13-21, No winner. €20 Lucky Dip Winners: Elma Kenny, Raymond Cassidy, Sean Cassidy, Theresa Brennan, Sean Connolly, Ollie Caffrey, Olivia O’Reilly, Philip Moran, Hughie Madden, Caroline McFadden. Next Weeks Jackpot: €9,400. Draw on Monday Dec. 5th 2016 in Kiernan’s Bar. Numbers drawn 02-08-19-27, No winner. €20 Lucky Dip Winners: Ronan Curran, Carmel Clarke, Clifford Fitzgerald, Paddy & Shane Clarke, Susan Meehan, Pog Carpenter, Pauline Clarke, Packie Tobin, Tommy Carroll, Nicole O’Connell. Numbers drawn 03-09-12-22, No winner. €20 Lucky Dip Winners: Sean Greene, Gavin Sweeney, Ann Sheppard, Jimmy Farrelly x 2, Bridie McQuaid, Eileen Brady, Margaret Reilly, Paul Curran, Gerry Harten. Numbers drawn 02-16-25-28, No winner. €20 Lucky Dip Winners: Donagh Maguire, Ciaran Lynch, Andrew Cassidy, John Flood, Trevor Nevin, Oliver Carolan, Adrian O’Donnell, Craig McGivern, Tony Morris, Peter Curran. Numbers drawn 04-09-12-26, No winner. €20 Lucky Dip winners: Trisha Smith, Mag Smith, John Clinton, Pauline Carpenter, Jim Gaffney, Catherine Reilly, Alan Dolan, The Halpin Family, Jenny Lynch, Sharon Hogan. Numbers drawn 09-15-19-24, No winner. €20 Lucky Dip winners: John Lee, Francis Stafford, Eddie Moran, Peter Curran, James Farrell, McFadden Family, Michael Tighe, Thomas Barrett, Mark Stafford, Jackie Taylor. Numbers drawn 19-20-21-28, No winner. €20 Lucky Dip winners: John Clinton, Conor Briody, Thomas Smith, Jenny Lynch, Larry Stafford, Francis Stafford, Dominic Moran, Doireann Reilly, Maria Curran, Dave Higgins. Numbers drawn 06-21-23-26, No winner. Numbers drawn 03-09-10-15, No winner. €20 Lucky Dip winners: Annie & Matthew Reilly, Mark O’Connell, The Beirne girls, Patsy Curran, Martin Stafford, Clare Cassidy, Ultan Cassidy, Amy Bennett, Michelle McQuaid, Paddy McGillick. 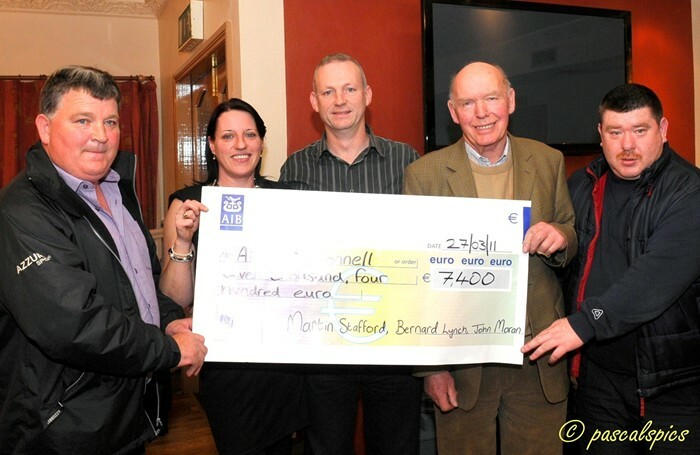 Next week’s Jackpot will be €7,800. Numbers drawn 04-05-11-18, No winner. €20 Lucky Dip winners: David Moran, Donagh Maguire, Jamie Meehan, Francie Greene, J.J. Carpenter, Helen Downey, Christine Lynch, Ann O’Brien, Jim Gaffney, Ollie Caffrey. Numbers drawn 04-10-19-24, No winner. €20 Lucky Dip winners: Peter Clinton, Glenda Flanagan, Mary Curtis, P. McMahon, Mary Curtis, Karen Smyth, Tony Morris, Joan Gaffney, Liam Farrelly, Packie Tobin, Catriona O’Neill Stafford. Numbers drawn 02-06-14-23, No winner. €20 Lucky Dip winners: Mary Meehan, G & L Stafford, Pascal & Margaret Reilly, Siobhan Kearney, Carmel Curran, Pat McGillick, Nancy McGivern, Fiona McQuaid, Peggy Carolan, Katie Kealy. Numbers drawn 02-06-21-27, No winner. Numbers drawn 03-06-18-23, No winner. €20 Lucky Dip winners: Amy Bennett, Annie Rooney, Julia Campbell, Claire Cassidy, Mag Smith, Adrian O’Donnell, Brendan Ryan, Peadar Farrelly, Pat Tighe, Geraldine O’Connell. Numbers drawn 04-05-18-23, No winner. €20 Lucky Dip winners: P. McMahon, Karen Smyth, Paddy Weldon, Cha Rogers, Oliver Carolan, The Galligan Family, Pete Rogers, Ann Murphy, Laurence Rogers, Suzanne Brennan. Numbers drawn 02-07-15-21, No winner. €20 Lucky Dip winners: Gabriel Curtis, The Clarke family, Georgina Curran, Catherina Stafford, Pete’s Cassidy, Pat O’Connell, Jim Gaffney, Christy Regan, Francie Greene, Pauline Clarke. Numbers drawn 05-06-23-28, No winner. €20 Lucky Dip winners: Helena Doyle, Kathleen Smith, Sarah Curran, Kitty Monaghan, Francis Stafford, Fiona Barrett, Gerry Kealy, Maria Rogers, The Halpin Family, Jenny Lynch. Numbers drawn 11-18-24-28, No winner. €20 Lucky Dip winners: Paul Drew, Peter Clinton, Dave Campbell, Rebecca O’Brien, Joseph Curran, Christopher Collier, Bernard O’Brien, Kate & Wayne Brennan, Ciaran Lynch, Eileen Branigan. Numbers drawn 01-14-15-26, No winner. €20 Lucky Dip winners: Rosemarie Walsh, Jamie Gaffney, Julia Campbell, Dermot Sheridan, Maura Barrett, Tina Dawson, Michael Dunne, Sean Kiernan, Thomas Dunne, Vincent Flanagan. Numbers drawn 01-03-06-17, No winner. €20 Lucky Dip winners: Jimmy O’Connor, Raymond Cassidy, Andrew Cassidy, Clare Cassidy, Peadar Farrelly, John McInerney, Carmel Curran, Clare Clarke, Genevieve Dolan, Mark Stafford. Numbers drawn 10-11-14-15, No winner. €20 Lucky Dip winners: Gemma Lynch, Paddy O’Connell, Billy McDonald, Carmel O’Rourke, Clare Cassidy, Marion Greene, Therese Cudupp, Christine Lynch, Rhodie O’Brien, David Moran. Numbers drawn 05-08-12-21, No winner. €20 Lucky Dip winners: Mark Meehan, Geoff Doyle, Enda Brady, Roisin Price, Gerry Kealy, Petes Cassidy, Christine Lynch, Andrew Rogers, Martin Reilly, Jerry Fitzsimons. Numbers drawn 11-15-21-27, No winner. €20 Lucky Dip winners: Chris Lynch, Cathal Brennan, Catherine Curran, Kitty Monaghan, Karen Smyth, Noah Gilsenan, David O’Connell, Gerry Kealy, Mark Meehan, Ronan Curran. Numbers drawn 05-06-07-10, No winner. €20 Lucky Dip winners: Mark Carey, Pog Carpenter, Thomas O’Brien, Joseph Curran, Donagh Maguire, Peter Clinton, Peter Curran, John Clarke, Mark Meehan, Kathleen Smith. Numbers drawn 06-12-14-28, No winner. €20 Lucky Dip winners: Carmel Curran, Angie Lynch, Claire Cassidy, Pat Tighe, Bernadette Curtis, Catherine Curran, Raymond & Andrew Cassidy, Meave Sheridan, Lorraine Drew, Patsy Curran. Numbers drawn 05-07-23-25, No winner. 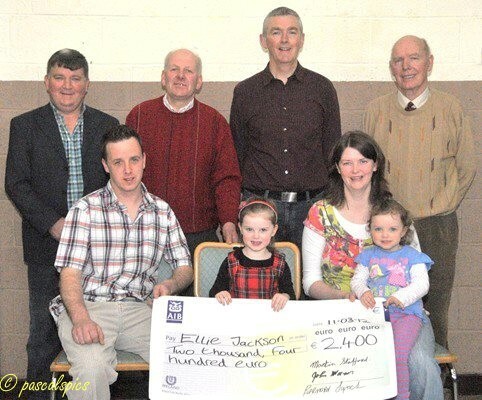 John Moran, Petes Cassidy, The Galligan family, Patrick Moran, Martin Dawson, Dáithí O’Reilly, Laoise Beirne, John Lee, The Cassidy Bro’s, Des & Mary Carolan. Numbers drawn 06-09-16-25, No winner. The Walsh Family, Barry Brennan, Orlaith Murphy, Justin Stafford, Peter Clinton, Michael Eager, Gavin Sweeney, Liam Farrelly, Thomas Tierney, Kathy Cooney. Numbers drawn 01-03-06-12, No winner. Numbers drawn 02-07-11-17, No winner. Dave Campbell, Paul Curran, Margaret Reilly, Lucy Carolan, Shane Connell, Paddy & Irene Smyth, Sean Gaffney, Sean Wall, Peggy Carolan, Ronan Curran. Numbers drawn 06-13-19-27, No winner. Shane McDonnell, The Halpin family, Gearoid O’Malley, Thomas Clinton, Sandra Tighe, Sean Downey, J.J. Carpenter, Niall Carolan, Ann O’Brien, F. Lynch. Numbers drawn 11-13-17-24, No winner. Claire Cassidy, Kathleen O’Brien, Phyllis Dunne, Jacinta Meehan, Martin Dawson, Niamh Gaffney, Raymond Cassidy, Claire Cassidy, Hughie Madden, Rosin Price. Numbers drawn 02-04-13-19, No winner. Ronan Curran, Sean Cassidy, Colm Cassidy, Michelle McQuaid, Edwina Olwill, Agnes Kiernan, Angie Lynch, Gerry McCormack, Joe Tobin, Margaret Rogers. Numbers drawn 05-13-17-27, No winner. Lawlor C/O S. Gaffney, Gabriel Curtis, Davy McDonnell, John Stafford, Laura Clarke, Kevin Lynch, Olivia O’Reilly, The Clarke family, Delores Dolan, Tommy Carroll. Numbers drawn 20-21-22-26, No winner. Galligan Family Oldcastle, Justine Stafford, Georgina Curran, Peggy C/O Francie Greene, Claire Clarke, James Meehan, Valerie O’Brien, Catherine Smyth, Fiona McQuaid, Cormac Price. Numbers drawn 01-15-17-21, No winner. Marie O’Connell, Kathleen Cooney, Marion Greene, Brigid Rooney, Kathleen Smith, Ann, Emma & Lauren Carolan, Tricia & Alan McGillick, Maeve Sheridan, Shane McCormack. Numbers drawn 07-17-21-26, No winner. 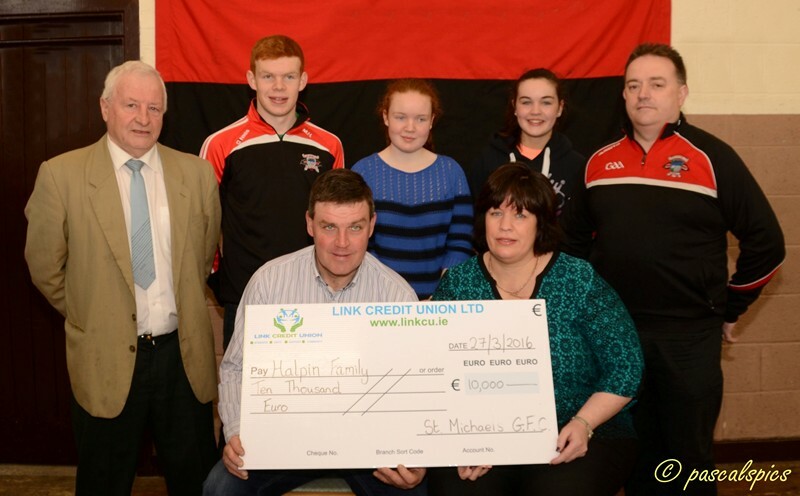 Pog Carpenter, Galligan Family Oldcastle, Larry Rogers, Mick Eager, Barry Brennan, Donna O’Rourke, Hughie Madden, Tina Dawson, Gearóid O’Malley, The Halpin family. Numbers drawn 02-03-07-24, No winner. Justin Stafford, Sean Hand, The Reilly Gang, Andrew Rogers, John Clarke, Orlaith Murphy, Luke Kearney, Amby Cassidy, Thomas Barrett, Anne Sullivan. Numbers drawn 10-11-25-28, No winner. Michael Flanagan, Oisin McKenna, Darren O’Connell, James McDonnell, Helen Clinton, Catherine Reilly, Michael O’Connell, Jack O’Connell, Sue Brennan, Kate Cooney, Tony Walsh.. Numbers drawn 07-12-15-19, No winner. Helen Clinton, Margaret Flanagan, Johnny McGovern, Joan Gaffney, Olivia McPhillips, Alan Jackson, Bernadette Curtis, Betty Meehan, Rachel Moran, Eddie Moran. Numbers drawn 02-05-12-28, No winner. Michael Tighe, The Coyne girls, Fiona & Shane O’Connell, Gabriel Curtis, Thomas Clinton, Olivia O’Reilly, Adrian O’Donnell, Paul Drew, Stephen Dolan, Barry Brennan. Numbers drawn 04-15-17-28, No winner. Robert Briody, Sean Briody, Larry Rogers, Claire Cassidy, Pog Carpenter, Mary Doherty, Clodagh Corcoran, Sean G, Darragh Muldoon, Ciara & Jamie Farrelly. Numbers drawn 09-10-20-24, No winner. Nisha Teeling, Margaret Reilly, Sylvia Reilly, Mary Doherty, Jim Mulchrone, Paul Drew, Margaret Cummins, Geraldine O’Connell, Gavin Meehan, Barry Brennan. Numbers drawn 01-13-14-27, No winner. Agnes Kiernan, The Hand Family, Anthony Gargan, Peadar Farrelly, Barney Gaffney, Agnes Kiernan, Maura Barrett, Colm Cassidy, John Clinton, Sinéad McCormack. Numbers drawn 04-11-12-26, No winner. Andrew Cassidy, Paddy & Irene Smith, Philomena Hayes, Niamh Sheridan, Susan Meehan, Anne McAuley, Bernard McPhillips, James Meehan Snr, Pete’s Cassidy, Roisin Price. Numbers drawn 08-11-13-14, No winner. Sean Briody, Louise Griffin, Cian Curran, Andrew Cassidy, Peter Rogers, David McDonald, Robbie Briody, Marie O’Connell, Elaine Bassett, Peter Curran. Numbers drawn 04-14-21-25, No winner. Gaffney Family, Roisin Price, Joe Tobin, Trisha Smith, Andrew Cassidy, Anne Lally, Vincent Flanagan, Oliver Carolan, Paddy McGillick, Keith Hannifan. Numbers drawn 02-05-08-27, No winner. Bernard O’Brien, Kathleen Clarke, Jimmy Tallon, Maeve Sheridan, Clare Cassidy, Martin Jackson, Christine Lynch, Geraldine Gargan, Aoife Flynn, Margaret Lanney. €50 Meat Voucher: Johnny McGovern, Bottle of Wine: Frances Stafford, Box of chocolates: Patrick Moran, Box of biscuits: Pat Tighe. 10 x €20 Lucky Dip winners: Kevin Lynch, Kathy Brady, Tony Clarke, Keith Hannifin, Ronan Curran, The Stapleton Kids, Mark Stafford, Brigid Rooney, Paul Curran, Thomas Clinton. €50 Meat Voucher: Tommy Carroll, Bottle of Brandy: Kathy Cooney, Bottle of Wine: Pat Smyth, Box of chocolates: Kathy Cooney, Box of biscuits: Helena Doyle. 10 x €20 Lucky Dip winners: Gabriel Curtis, Deirdre Gaffney, Andrew Cassidy, The Gaffney brothers, Colm Maguire, Collette Reilly, Olivia O’Reilly, Nakeitha Carolan, Thomas Bennett, Pat McGillick. 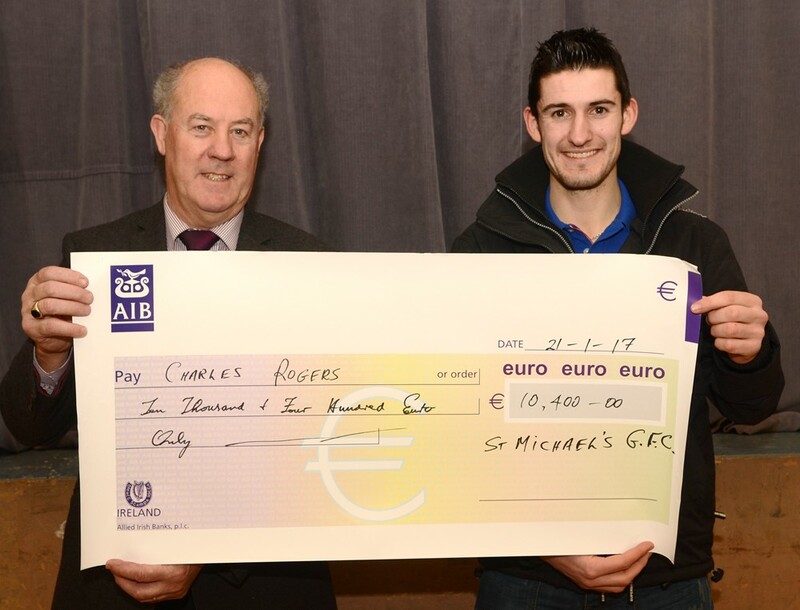 €50 Chadwicks Voucher: Davy McDonnell, Bottle of wine: Andrew Cassidy, Box of sweets: Gemma Lynch, Box of biscuits: Gerry Kealy. 10 x €20 Lucky Dip winners: Evanne, Ailbhe & Laoise Beirne, Colm Cassidy, Cormac McManus, Thomas Barrett, Linda Morris, Jimmy Tallon, Alan Reilly, Raymond Cassidy, Gearóid O’Malley, P. McMahon. 10 x €20 Lucky Dip Winners: Dermot Walsh, Margaret Reilly, Helen Clinton, Tom & Mary Moran, John Clarke Corfad, Pat Dillon, Martin Reilly, Katie Reilly, Gerry O’Malley, The Reilly gang Horath. Next weeks Jackpot: €7,200. Numbers drawn: 03~04~06~08, No Winner. Gavan Sweeney, Caroline Walsh, Alan Carolan, Cormac McMahon, David O’Connell, Peggy Carolan, Pauline Carpenter, Bridie Tierney, Cathleen Moran, Pat Tighe. Next weeks Jackpot: €7,000. Clare Clarke, Abbie Jackson, Liam Yore, Kevin Lynch, Terry Kangley, Paddy Flood, Michael Tighe, David Moran, Gabriel Curtis, Martin Dolan. Next weeks Jackpot: €6,800. Numbers drawn: 08~11~19~26, No Winner. Dean & Jade O’Rourke, Bridie Tierney, Charlene Campbell, Therése Brennan, James Meehan, Dave Reilly, Kathleen Blaney, Colm Sharkey, Kristian Kellett, Simon Dunne. Next weeks Jackpot: €6,600. Numbers drawn: 05~09~12~17, No Winner. Sean Connolly, Niall Carolan, Sandra Tighe, Stephen Dolan, Patsy Crosby, Galligan family Oldcastle, Justin Stafford, Pete’s Cassidy, Margaret Reilly, James McInerney. Next weeks Jackpot: €6,400. 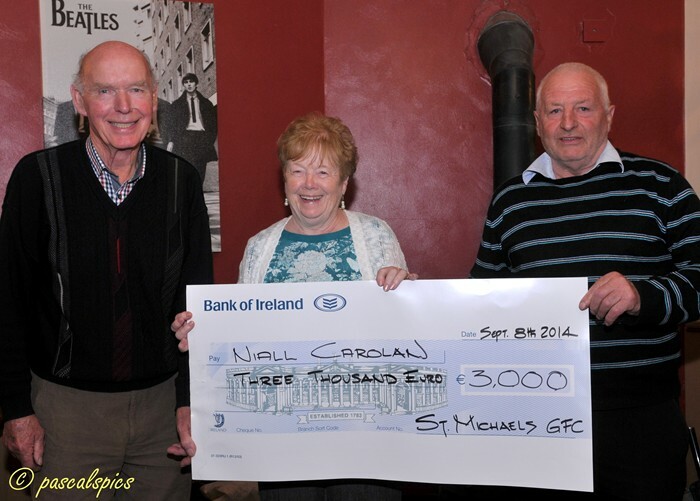 October 19th 2015, Jackpot: €6,000. Numbers drawn: 03~14~26~27, No Winner. Marie O’Connell, Tommy Carroll, Claire Cassidy, Amy Bennett, David O’Connell, Aidan McDonnell, Gavan Sweeney, Geraldine McPhillips, David Moran, Simon Dunne. Next weeks Jackpot: €6,200. 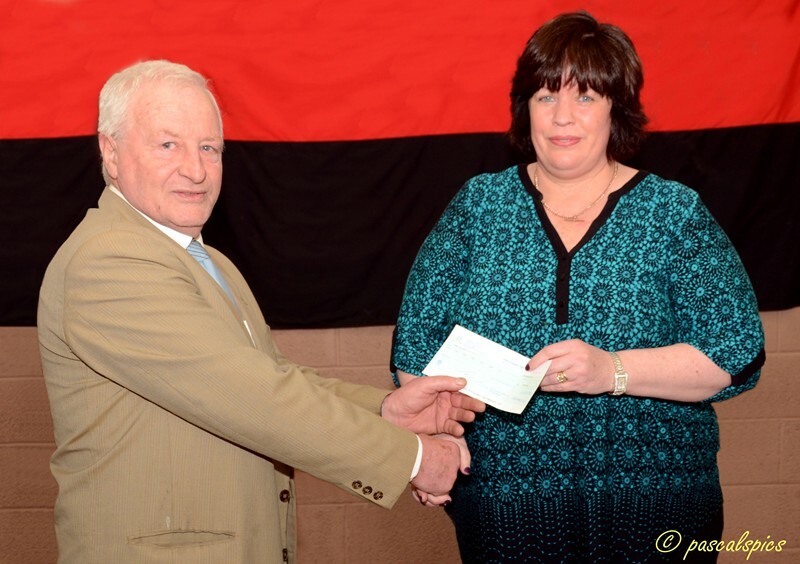 October 12th 2015, Jackpot: €5,800. Numbers drawn: 13~18~19~21, No Winner. Davie McDonnell, Mary Doherty, Caroline O’Donnell, Dave Reilly, Bernadette Curtis, Colm Cassidy, Martin Stafford, Jamie & Ben Reilly, John Stafford, Liam Hand. Next weeks Jackpot: €6,000. September 29th 2015, Jackpot: €5,600. Numbers drawn: 01~08~12~18, No Winner. Vincent Flanagan, Pete’s Cassidy, Claire Cassidy, Siobhan Crosby, Alan Carolan, Kathy Cooney, David Brady, Yvonne Duffy, Brigid Rooney, Packie Tobin. Next weeks Jackpot: €5,800. September 22nd 2015, Jackpot: €5,400. Numbers drawn: 03~08~18~22, No Winner. John Lee, Jackie Lynch, James Meehan, Tom Walsh, Helena Doyle, Amy Bennett, Martin Jackson, Barry McBrearty, Pat O’Connell, Patricia Cassidy. Next weeks Jackpot: €5,600. September 14th 2015, Jackpot: €5,200. Numbers drawn: 06~19~25~27, No Winner. Pat Dillon, Colm Sharkey, Del Conaty, Peter Clinton, Jimmy Tallon, Tom O’Brien, Rebecca O’Brien, Joe Tobin, Chris Lynch, Bernadette Burd. Next weeks Jackpot: €5,400. 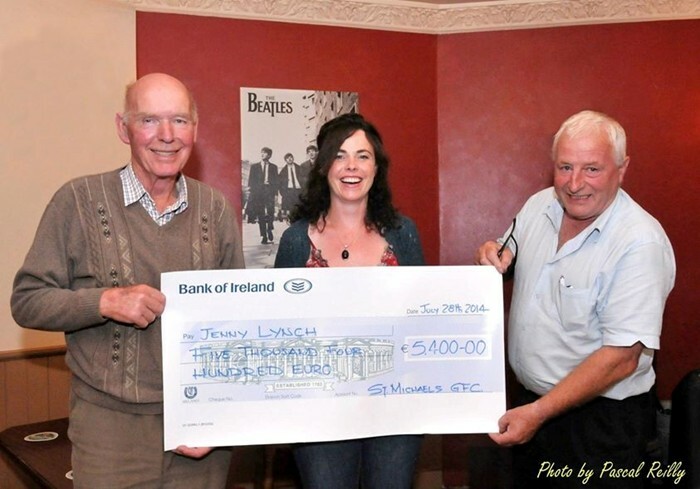 September 7th 2015, Jackpot: €5,000. Numbers drawn: 08~10~15~22, No Winner. Cormac Price, Simon Dunne, Larry Rogers, Keith Griffin, Tommy Sheridan, Collette Reilly, Cha Rogers, Tina Dawson, Pat Murtagh, Katie Kealy. Next weeks Jackpot: €5,200.